As reported, Neurosis will be releasing their latest LP, Honor Found In Decay, in late October. For the purposes of heightening our anticipation, a trailer has surfaced. Watch below. The band will also be playing a London date with Godflesh in December. NEUROSIS today proudly reveals a brand new visual trailer created for their anticipated tenth studio full-length, Honor Found In Decay. 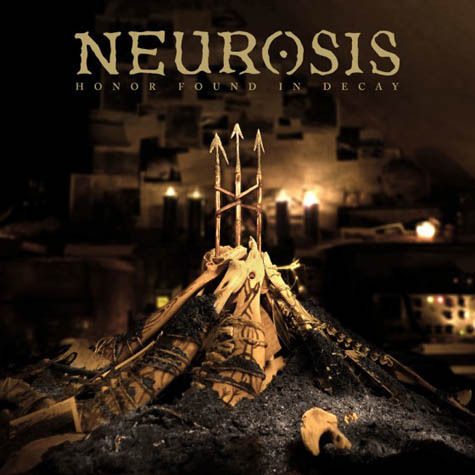 Created by video architect Kenneth Thomas, also responsible for producing the mini-documentary for NEUROSIS’ 2007-released Given To The Rising, the intense look into the new opus features intimate details of the album’s layout hand-crafted by the band’s visual specialist by Josh Graham, personal commentary from guitarists/vocalists Scott Kelly and Steve Von Till on the creation of Honor Found In Decay, as well as the first brief moments of audio to be publicly unleashed! States Steve Von Till in the early moments of the preview, "A legacy can only be assured if we continually burn down the past and plant seeds in the ashes to grow new, greater things," and is followed by founding member Scott Kelly, who boldly affirms, "If you don't make a record that you think eclipses your previous record, then... you've failed." Absorb this foretaste of Honor Found In Decay AT THIS LOCATION. In addition to their imminent performance at ATP's Nightmare Before Christmas in England – the lineup culminated by Steve Albini’s band Shellac, and including Wire, Mission of Burma, Oxbow, Melt Banana, Shellac and more – another UK NEUROSIS performance has been confirmed to take place just days later. The extraordinary performance will devastate the HMV Forum in London alongside the almighty Godflesh on December 2nd, as the only other UK concert in support of Honor Found In Decay. Stated Von Till about this appearance: “Neurosis and Godflesh together is long overdue! We have been admirers of Godflesh since their first recordings. Streetcleaner changed heavy music forever. I don't think anyone can argue that this will be an extremely powerful and special night for all of us." Honor Found In Decay will reaffirm to the planet why NEUROSIS remain one of the most important heavy acts in existence. The album will emerge through the band’s own Neurot Recordings, in Germany October 26th, in the rest of Europe October 29th, and in North America on October 30th, with their cohorts at previous label home Relapse Records confirmed to handle the vinyl release of the album.